Compare Activa 3G, i, 125 vs Hero Maestro – Maestro is Hero’s scooter and it is one of the best selling scooter in India. It comes after Honda’s Activa in terms of sales. Honda Activa is the best selling scooter in India. Are you now confused with what to buy? Honda’s Activa has become synonymous with the scooter in India. Maestro has become the choice for the boys but Activa has been able to keep its crown in both men and women section alike. Maestro is masculine and sturdy. It suits best for boys. 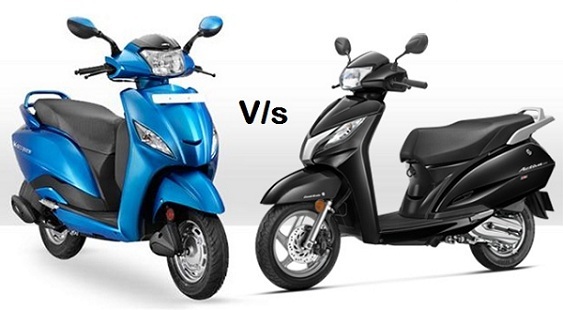 Let us compare Honda’s Activa series with Hero’s Maestro in this article. If you are buying scooter, then price is always considered as one of the most important factors. In Delhi, Activa 3G’s ex-showroom price is INR 49,900. Price of Hero’s Maestro in Delhi ex showroom is INR 48,300. In terms of price, Maestro can be a better bet. Mileage is 42-52 kmpl for Activa 3G on Indian roads. Maestro has ARAI fuel efficiency technology of 60 kmpl. But when Maestro comes to road, it gives a comparable mileage to Activa’s mileage. Both Maestro and Activa have same 5.3 L of fuel tank capacity. Both flaunts 109 cc engine. So, we cannot compare on the basis of cc in this case. Top speed of Hero’s Maestro is 90 kmph. On the other hand, Honda Activa has a speed of 85 kmph. Here, Maestro has an edge over Activa series. Ex showroom price of Activa 125 Dlx is around INR 60,500. Price of Hero’s Maestro in Delhi ex showroom is INR 48,300. There is an evident difference between the pricing but on seeing the features, these price difference can be neglected. Mileage is 42-52 kmpl for Activa 125 on Indian roads. Maestro has ARAI fuel efficiency technology of 60 kmpl. But when Maestro comes to road, it gives a comparable mileage to Activa’s mileage. Both Maestro and Activa have same 5.3 L of fuel tank capacity. Honda Activa 125 has an engine displacement of 124.99 cc. On the other hand, Honda Maestro has 109cc engine. The price has compensated this difference in cc. Activa i is available at a price of INR 47,000 in Delhi ex-showroom. Maestro is tagged at INR 48,300 in the ex-showroom of Delhi. Mileage is 66 kmpl for Activa i on Indian roads. Honda Activa I has HET fuel efficiency. Maestro has ARAI fuel efficiency technology of 60 kmpl. But when Maestro comes to road, it gives a comparable mileage to Activa 3G and Activa 125’s mileage. Both Maestro and Activa have same 5.3 L of fuel tank capacity. Activa I has not been designed for cc lovers. It has only 102cc engine whereas Hero’s Maestro flaunts 109 cc engine. In terms of top speed as well, Maestro is more favorable. It has top speed of 90 kmph whereas Activa i has a top speed of 82 kmph only. VERDICT: If price is not an issue, then you should go with Honda Activa 125 model. But, if price is an issue and you want a sturdier performance, then you should go with Hero’s Maestro.